For a nothing less than incredibly stylish ensemble, marry a Bugatchi Two Button Blazer from Nordstrom with beige dress pants. 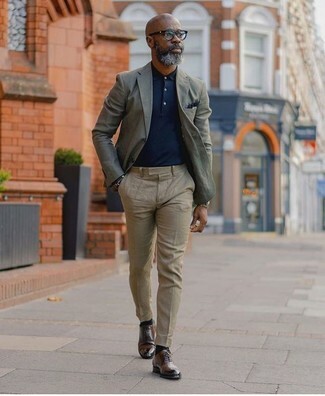 For something more on the daring side to complement this ensemble, opt for a pair of dark brown leather derby shoes. 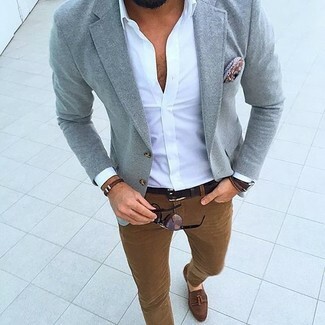 This combo of a Bugatchi Two Button Blazer and tobacco chinos is so easy to throw together in no time, helping you look awesome and ready for anything without spending too much time combing through your closet. Sporting a pair of brown suede tassel loafers is a simple way to add some flair to your getup. Consider teaming a Bugatchi Two Button Blazer with dark brown dress pants like a true gent. 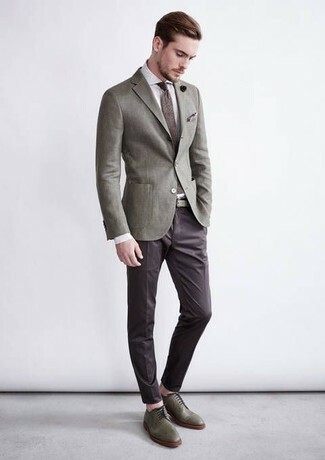 Rock a pair of olive leather derby shoes to make the getup more current. 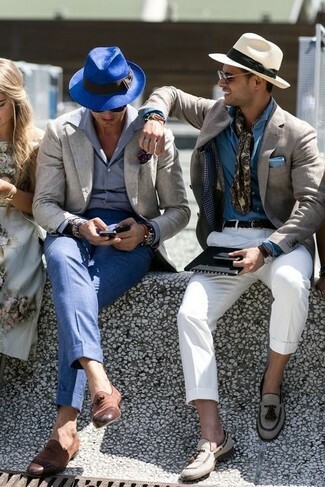 For a nothing less than incredibly stylish ensemble, consider pairing a grey blazer with blue dress pants. Choose a pair of brown leather tassel loafers to make the getup more current. This combo of a Bugatchi two button blazer and navy chinos is so easy to throw together without a second thought, helping you look amazing and ready for anything without spending a ton of time going through your closet. 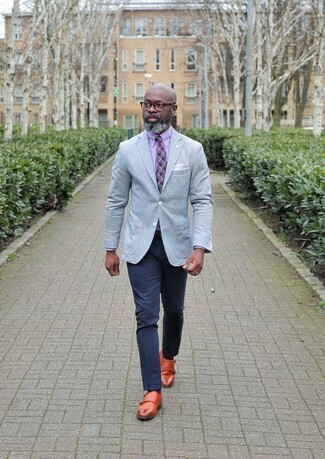 Spruce up this look with tobacco leather double monks. This combo of a Bugatchi Two Button Blazer from Nordstrom and white chinos is so easy to make up without a second thought, helping you look seriously stylish and ready for anything without spending too much time rummaging through your closet. You could perhaps get a little creative in the shoe department and spruce up your look with brown leather derby shoes. This combo of a Bugatchi Two Button Blazer from Nordstrom and a green vertical striped dress shirt is so easy to throw together without a second thought, helping you look awesome and ready for anything without spending a ton of time digging through your closet. 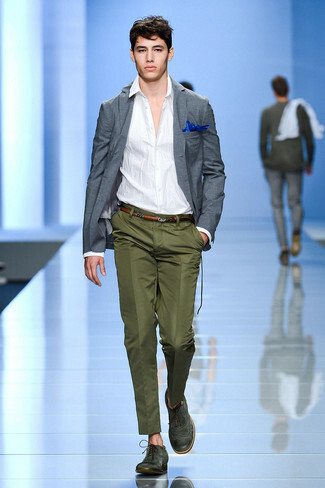 A Bugatchi grey blazer and olive dress pants will showcase your sartorial self. To bring out the fun side of you, complete your ensemble with dark green leather brogues. Opt for a grey blazer and charcoal dress pants for a sharp classy look.